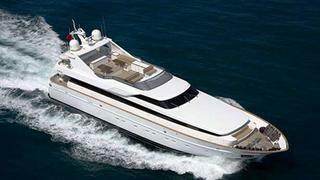 A call to Marine Marketing confirms that they've sold the 31.1m Akhir motor yacht Elisa to a direct client. Built by Cantieri di Pisa in 2005, Elisa sleeps eight guests in a full-beam master suite, two double staterooms and a twin cabin while twin 2,280hp MTU engines give her a cruising speed of 21 knots. Elisa was asking €3.95 million.